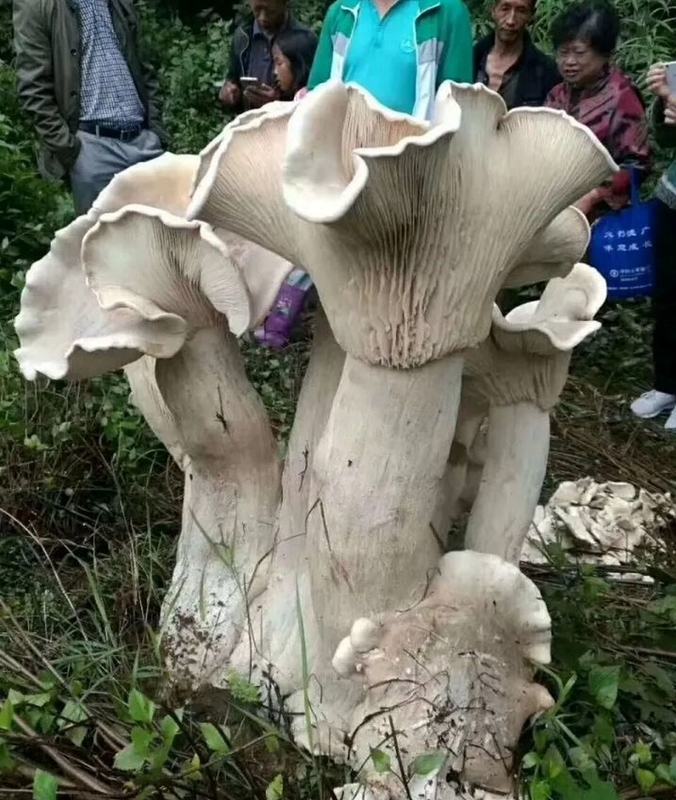 A Chinese farmer has discovered massive mushrooms, and each day, 30,000 people have been visiting to catch a glimpse of the giant fungi. An 81-year-old farmer in a village near Tengchong, Yunnan Province, in southwest China, stumbled across a massive cluster of mushrooms this week that have earned themselves the title ‘king of mushrooms’. The giant fungi, some of which are 83.5 centimetres high, are edible, according to a researcher from Chinese Academy of Sciences. The largest has a diameter of 40cm, which the villagers nicknamed ‘elephant foot’. The enormous fungi were later identified as Tricholoma giganteum, a non-toxic mushroom commonly found in tropical and subtropical areas. News soon spread of the massive fungi, enticing visitors to come and take pictures and even selfies with the rare mushroom marvel. Quickly turning into a star attraction overnight, it’s estimated that the mushroom has attracted an average of 30,000 visitors a day since its discovery on October 19, 2017. All hail the king of mushrooms! A huge interest in the monster mushrooms meant that local transport authorities had to display custom signage to give tourists directions to the village. Some visitors were even seen throwing coins and money notes at the wild mushroom in a bid to wish for good luck and fortune. The local villagers later erected a fence to protect the mushrooms and prevent anyone from trying to steal it. Villagers have since agreed to pull out the fungi and donate it to Tengchong Wild Plants and Animals Protection to keep as a preserved plant specimen.